Normally about this time, I'd be posting about how the season at WAIS Divide was a complete success. I would be rehashing all of ups and downs, and reliving with all of you what it felt like to be there for the absolute final season of drilling....and very likely my last season down here (at least for a while anyway). I would probably go into great detail about just what replicate drilling was like, and how as a group, the drillers were able to give us cores from 5 different replicate depths. That post is coming soon. There will undoubtedly be a lot of season pics too. But for now, I sit here in McMurdo in a rather sad and somber mood, not really into the idea of celebrating. 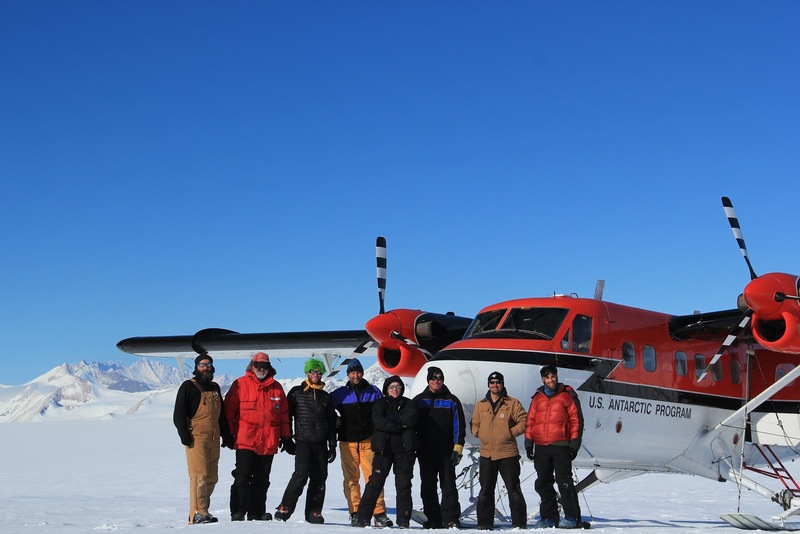 We received word a few days ago while still out at WAIS Divide, that a Kenn Borek Twin Otter plane went missing as it was flying from South Pole back to the McMurdo area. All we knew was that its ELT was triggered somewhere over the Trans-Antarctic Mountains. We had two separate Twin Otter crews at WAIS this year as well as a crew flying a Bassler DC3. In total, we probably had over 15 Kenn Borek pilots either come through, or work out of WAIS. To all of these guys, the news of the missing plane hit hard. But there was still hope......Until yesterday. Yesterday what have been our worst fears were confirmed when a helicopter was finally able to make it to the site of the triggered ELT. Tail wreckage was positively identified on a steep slope near the summit of Mt. Elizabeth. There were no indications of survivors. Over the past 5 years I've come to know many of the Kenn Borek team. Last year I had the privilege of spending two weeks flying in and around Union Glacier servicing Polenet Stations with two of their finest pilots on a Twin Otter (See pic below). The news of the crash is simply heartbreaking. I think of the lost crew's family and of the rest of the Borek Team...and it puts a horrible sinking feeling on what would have otherwise been a great and successful season. So for now, my thoughts are of these lost explorers. Rest in peace fellow Antarcticans...we are all grateful for how much you do and for how many risks you have taken for all of us goofy scientists and grad students. 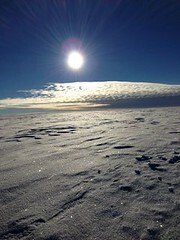 2013 Arrives in West Antarctica, a photo by John 'Lakewood' Fegyveresi on Flickr. We're over the half-way point in our 2012-13 field season here at WAIS Divide. The replicate ice coring that proved to be quite problematic last season, has been working like a charm this year. We are targeting 4 different core depths to be drilled at an angle off the main borehole that was completed early last season. So far, we've already finished 2 of the cores (each over 50 meters in total), and we are a good way into the third. If everything stays on track, we should wrap up the season right on schedule or perhaps even a smidge early. I have also successfully deployed my five snow surface temperature sensor stations. Each one took about a day to calibrate and install...but they've all been recording non-stop for over two weeks. It's getting to that point in the season where everyone is getting a wee bit homesick, and I know I have certainly started dreaming about getting back. We technically have 3 weeks left of possible drilling, but like I said, I suspect we'll end a smidge early. We all enjoyed a really nice Christmas, New Years, and even Apocalypse (Dec 21st) parties in camp. Lots of really great camp staff and science folks this year. Everyone gets along great and we all work together very well. On a running front, I managed to slip my name back into Leadville again...as well as Finger Lakes. I also have Vermont scheduled...but we'll see about that one. 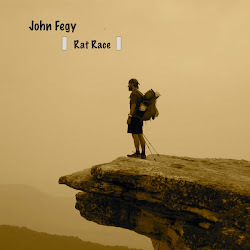 My big goal for 2012, now that Hardrock didn't pan out, will be to run the Plain 100 in September. I'm putting it on my calendar now. I have another escapade possible planned for later in the year, but I will leave that off the record for now. The knee is doing better, but the heel still bothers me on and off. Not sure what to do next with it. I've been forgoing the running down here and instead been skiing a lot. That's about it for now. I look forward to getting back home and getting my next paper written/submitted.